At the beginning of 2014 I moved from Sydney, where I had lived from the age of 18, to Canberra in the Australian Capital Territory. Having previous gained all my adult educational and work experience in Sydney this has been a significant shift in lifestyle and scenery. I have been fortunate enough to find creative professionals already working within the Canberra art scene who have been kind enough to allow me to work with them, and in doing so allowed me access to their own creative networks. The first project I have undertaken since moving to Canberra has been curating an exhibition through M16 Artspace in Griffith. I was fortunate enough to have local writers Nigel Featherstone, Sarah Rice, C J Bowerbird and Yolande Norris and visual artists Gina Wyatt, Jacklyn Peters, Julian Laffan, Ian Robertson and Caren Florance agree to work with me on a exhibition titled Wordsmith. 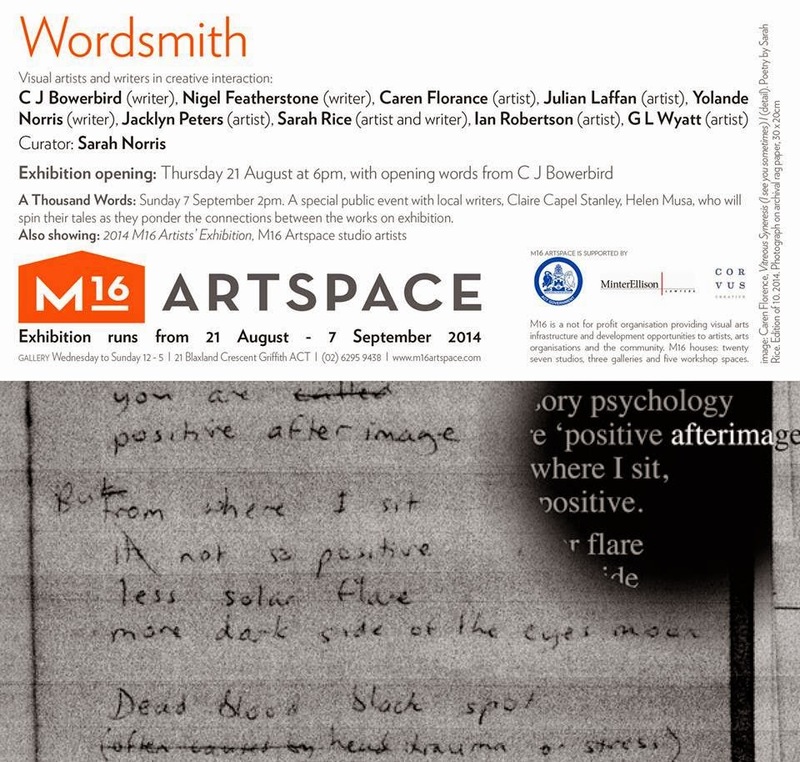 Wordsmith is a collaborative project that has brought together visual artists and writers in a creative interaction to explore the common ground between these differing, but inextricably linked mediums. Wordsmith is a collaborative project that has brought together visual artists and writers in a creative interaction to explore the common ground between these differing, but inextricably linked, mediums. This exhibition will be taking place between the 21st of August and the 7th of September 2014 at M16 Artspace in Griffith, ACT. The opening night will commence at 6pm on Thursday the 21st of August, with opening words from local spoken word artist and 2013 Australian Poetry Slam Champion C J Bowerbird. A series of written works, varied in both their scale and style, were produced by a number of locally based writers. These works then became inspiration for a group of artists who responded through the production of a collection of equally diverse visual artworks. I made an effort to match writers and artists that I felt would have the greatest potential for an interesting and productive interaction, based on my awareness of their previous work and my exchanges with each of them as the project evolved. C J Bowerbird was paired with Jacklyn Peters, Nigel Featherstone with both Julian Laffan and G L Wyatt, Yolande Norris with Ian Robertson and Sarah Rice with Caren Florance. Artist and writer Sarah Rice has contributed both visual and written material to this exhibition, fulfilling the roles of writer and visual artist and in the process clearly demonstrating the common threads that tie these two disciplines together. The result of these collaborations has been incredibly successful, with both art forms gaining from their relationship with the other. In addition to sharing material many of these pairings have developed into collaborative partnerships, deepened by conversation and creative co-operation and hopefully further elaborated through an open-ended and evolving dialogue that extends beyond the scope of this project. Just as each of the writers has produced a distinct work each visual artist has responded uniquely to the material they have received, through the scope of their individual practice. This process has resulted in a diverse range of works that reflect the range of individuals who have come together to create this exhibition. By displaying these two mediums alongside one another the connections created during the creative process can become apparent and the broader commonalities between literature and the visual arts are exposed. Curating this exhibition has allowed me the opportunity to work with a varied and talented group of local creative professionals. It has also provided me with an insight into the network of connections, both direct and indirect, that were already in existence between them. Those connections contributed significantly to the development and success of this collaborative project. Having recently moved to Canberra I have greatly enjoyed the opportunity to gain a greater awareness of the range of exceptional creative professionals producing work in the local area. 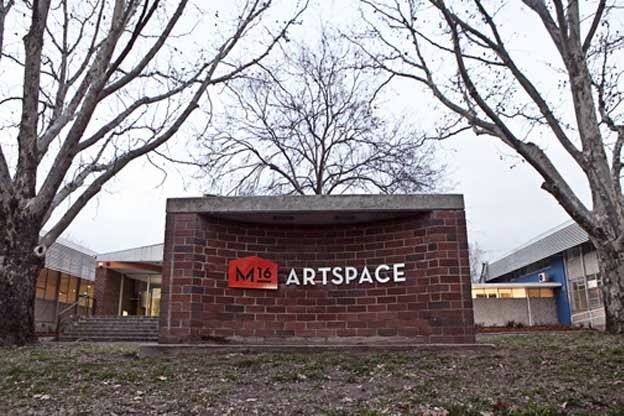 During the exhibition period M16 Artspace will also be hosting the 2014 M16 Artists Exhibition featuring M16 Artspace studio artists. A special public event to compliment these exhibitions, A Thousand Words, with local writers Claire Capel Stanley and Helen Musa will be taking place on Sunday the 7th of September at 2pm. These two writers will spin their tales as they ponder the connections between the works on exhibition.